IPL Cricket, undoubtedly, is the most favorite sport of the country and the excitement level reaches its peak during summer season as IPL begins. The matches are played in very limited venues and so not everyone can watch IPL match live. Similarly it is not possible for the people on job to remain glued to the TV screens during their working hours. But that doesn't mean that such cricket aficionados will miss out all the fun. There are plenty of IPL android apps around that are going to keep the users updated with each and every happening on the cricket ground. 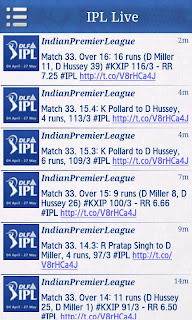 Here we present before you the best Android Apps for IPL 2013 Live Scorecard & News. This app comes from the established cricket website and as a result provides a comprehensive coverage for any format that is being played around the world, including IPL. Not only can one watch the match live, he can also get ball by ball updates right on his phone. The app shows you the complete scorecard, the whole commentary of the match and lastly a full match report so that the user can have all the required information. The user interface is very easy too and a simple tap on menu will let the user know which all matches are going on currently. Similarly other details can be obtained just by simple taps. 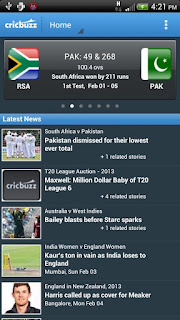 It is one of the highest rated cricket app on android. 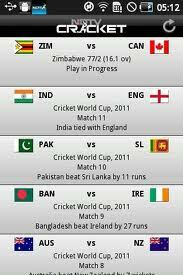 Live Cricket scores provides the user with all the relevant information about the matches being played currently. All the IPL matches are given comprehensive coverage and ball by ball details are provided by the app. The screen gets refreshed automatically as the new updates come in. The user interface is pretty straightforward and one need not put many efforts to understand it. 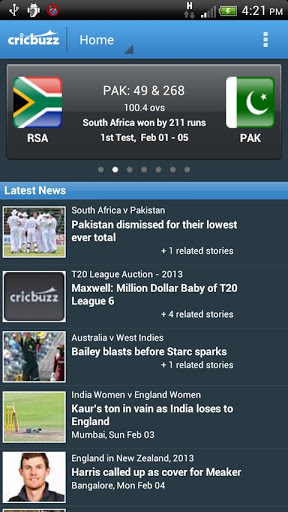 Cricbuzz is another popular cricket based portal which has released its own app for android platform. This app covers all the international matches along with IPL matches. 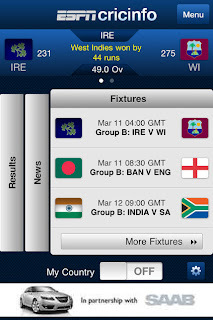 The user gets to see the latest score, ball by ball commentary and other relevant information through this app. One very amazing feature of this app is that the voice commentary is available in both Hindi and English. The user interface is very simple and makes it easy for a even a naïve person to handle it. The USP of this app is that it can be used as a widget on the home screen. So the users can know about the latest score updates on their home screen without actually launching the app. When the user makes use of app, he/she can get full scorecard as well as ball by ball commentary. This app doesn’t consume much battery and its interface is also very simple. It is easily one of the most sought out android apps for cricket around. The most beautiful thing about this app is that it has been designed to provide the user with optimum experience on his/her mobile. Like other apps discussed above, this app to provide live scorecard and ball by ball commentary. The live score is shown on the home page itself and the app also lets you see the photos of the match. The interface, as already mentioned, is very simple. This is another app which can be used as widget to get the updated score on the home screen of your phone. Apart from that this app provides you with the points table for all the teams playing in the IPL, along with all the important statistics related to match including records and player details. The user interface of the app is also good. 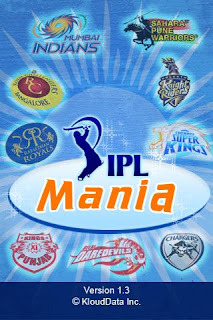 IPL Mania provides the user with the complete match schedule of IPL. It even sends you a reminder about the matches if you have your favorite teams marked. It provides you with live feeds of the match being played. 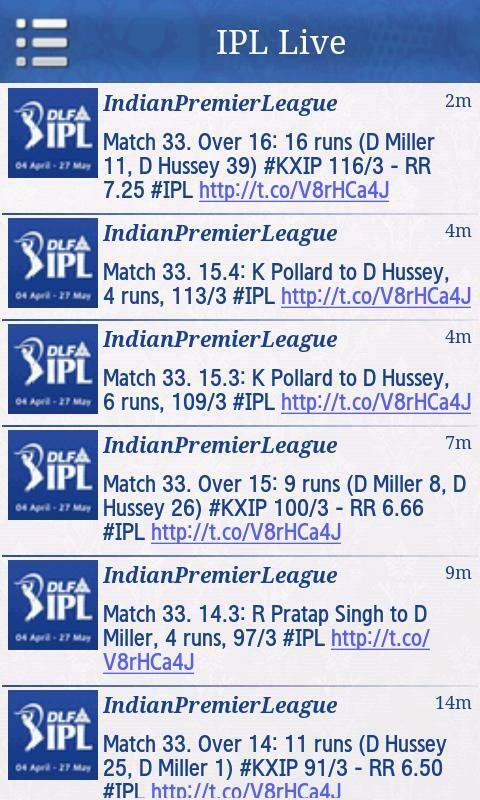 The IPL twitter feed helps the user keep himself abreast with all the happenings in the IPL. Lastly, the user interface is pretty cool and designed to give the user an awesome experience.